#Aww: One of the Best Wedding Lehengas You Will Ever Come Across! 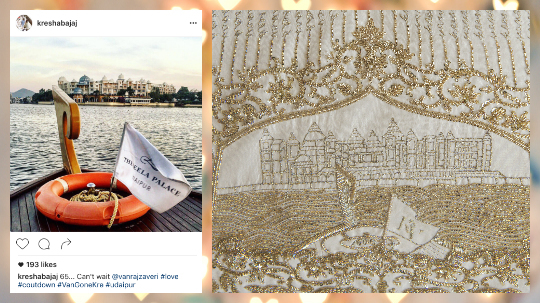 It’s the wedding lehenga that took our breath away - hand-crafted and fully customised with the couple’s love story! 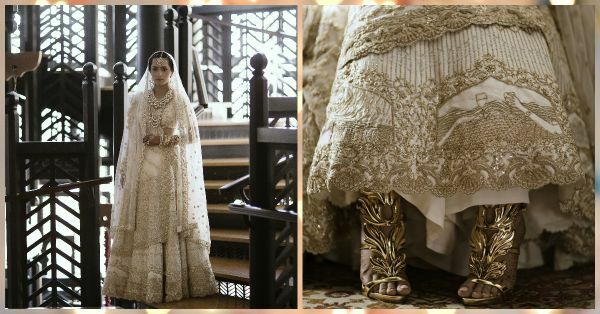 An unusual colour scheme - white and gold - in a country that loves the bridal red; and a bride who does NOT like Indian-wear in any form really set this story apart! 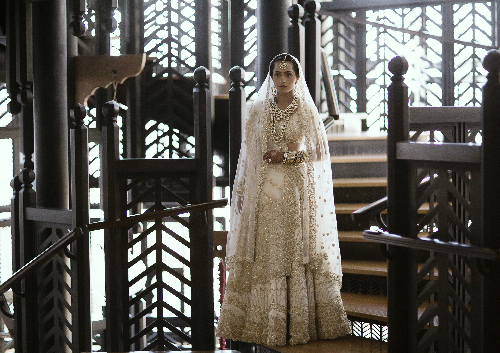 We spoke to Kresha Bajaj of Koecsh Studio about the story behind her stunning, customised bridal lehenga. “I’ve never had a liking for traditional Indian clothes. Black is my favourite colour and my personal style is very Western and edgy,” says Kresha. Her label Koecsh is a reflection of this. When she was asked to show her label at Lakme India Fashion Week in 2014, she decided to experiment with Indian-wear, and designed wedding lehengas with capes and sarees with spiked boots, for example. It’s this design sensibility that filtered down to her own trousseau when she was designing clothes for her wedding functions - sangeet, mehendi, pheras and reception. “I knew I had to wear traditional for my wedding outfit. I went to a lot of shops and saw some exquisite clothes. I liked them on others but nothing was me,” she shares. That’s when she took the decision to make all her own clothes with the help of her “amazing” Koecsh team. The first step was to learn the traditional Indian embroidery techniques - zardozi, aari, nakshi, sallie etc - which she had never used before. “The bridal lehenga is the set piece of the trousseau. But it’s only worn once and then just lies in the closet. Then I remembered that Adrienne Maloof of the Real Housewives of Beverly Hills Fame had framed her wedding dress and I planned to do exactly that - hang it as art in my walk-in closet,” says Kresha. She also wanted her wedding dress to tell the story of her and Vanraj’s relationship. But she was aware that it could look “super-comical and silly”. 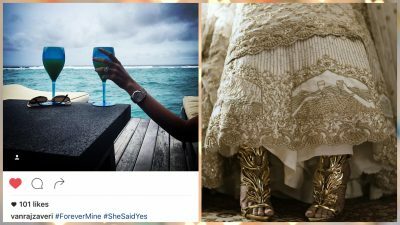 Which is why she chose to choose only specific details - like an Instagram post by Vanraj of her wearing the engagement ring after the proposal in Maldives. She also did a panel with her version of the same moment - this time taken from her Instagram account. The couple had met at a charity fund-raising event for saving the cetaceans so she decided to embroider the hem with dancing dolphins. Another kali shows a moment from their first trip to The Leela Palace in Udaipur, when they were visiting to finalise their wedding arrangements. Kresha used tulle and a novelty silk fabric - which is actually used for making sherwanis - for the construction of her bridal lehenga. “It doesn’t have the sheen which most Indian silk fabrics do but has a vibrant matte finish instead. It’s very lightweight and holds embroidery really well,” says the designer. Once her vision for the outfit was in place, Kresha started drawing out the kalis on huge sheets of paper. The designs were then transferred to the cloth and embroidered in a combination of arri and zardozi. Zari work was used for specialised work, for example their names picked out in her own handwriting. 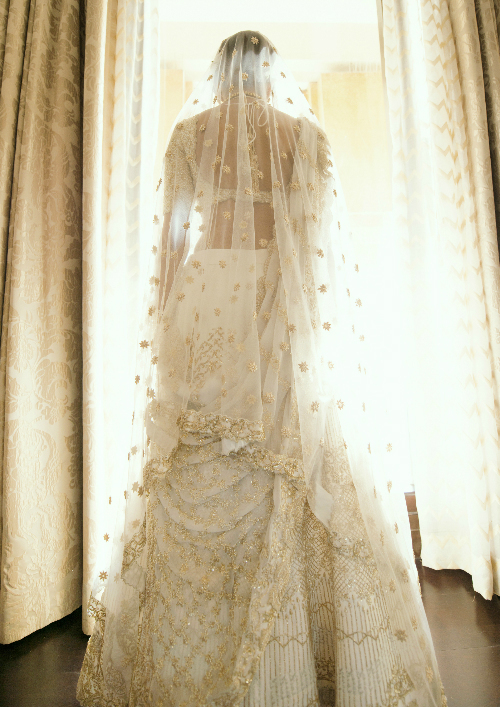 For the lehenga shape, Kresha went with a simple and classic 12-kali wedding lehenga. To keep the A-line shape, she added a little bit of can-can.. Her blouse had an all-over chequered pattern and had little flowers in a diamond-shape picked out in silk thread. Kresha draped a georgette dupatta- with the border of jumping dolphins! - on her body. The net chunari which she took on the head had a simple border of floral bootis. The entire trousseau-making process took close to 3-and-a-half months. “I did nothing nothing else during this time to the chagrin of my family,” she laughs. “My bridal lehenga reflects my design sensibilities - there aren’t many florals or vines, but a lot of graphic elements and geometrics. 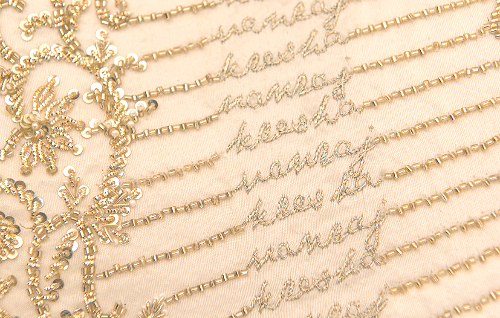 It’s the technique of embroidery that makes it look Indian,” shares the newlywed. 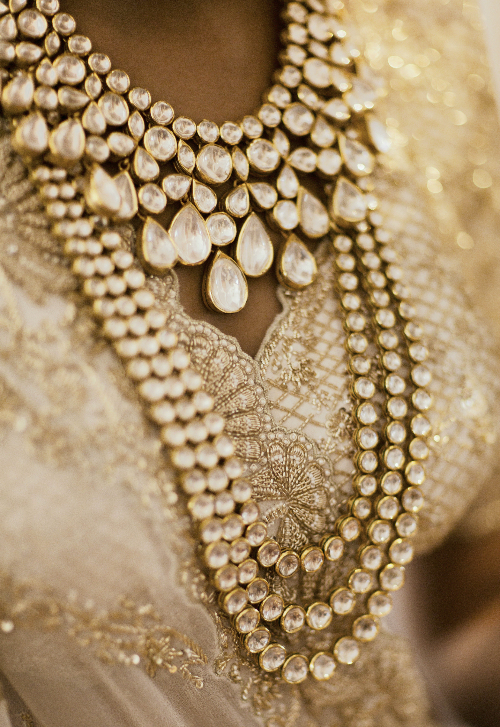 All her jewellery was designed by her husband who had no idea how her lehenga looked! He just designed a classic jadau set for her which she saw only two days before the wedding. She plans to frame her wedding lehenga right opposite her dresser in her new home. Congratulations, you two love birds! Images shot by The House of Pixels and shared by Kresha Bajaj. HAVE A STORY IDEA FOR POPxo? If you want to hear about it, we can write about it! Just tell us your idea here! 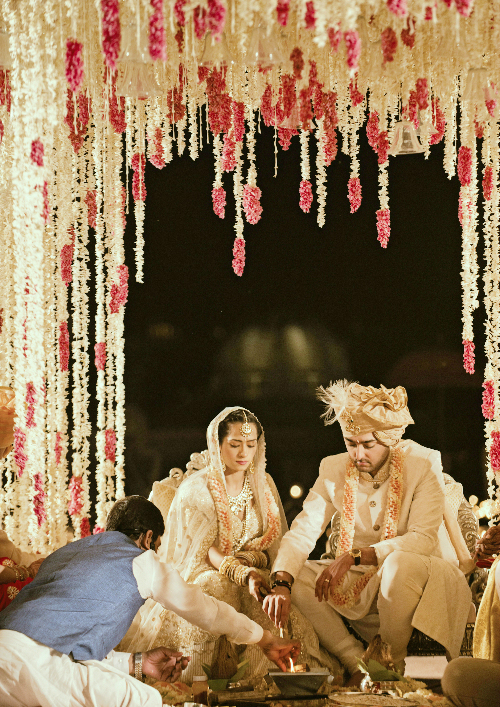 MUST-READ: Why It’s Totally OKAY To Not Wear A Designer Bridal Lehenga! MUST-READ: 6 Brides Who Wore Lehengas That Can Actually Be Worn Again!